What is the role of information in nature? 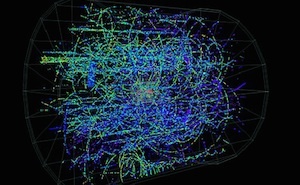 Traditionally, physicists have used energy as a fundamental concept to describe natural phenomena. Can information be an alternative way to describe nature in all of its complexity? How is information encoded in the shapes that we see, from atomic nuclei to leaves and clouds to stars and the universe as a whole? Although we use the term all the time, information is notoriously hard to define. I am interested in its relationship with another term that is hard to define, entropy. In particular, the entropy of shapes and how nature selects them. Is there a “Least Information Principle” in nature analogous to the “Least Action Principle”? How did the universe emerge from a period of primordial inflation? According to the modern cosmological view, what we call the big bang was the transitional event from a period of rapid expansion to a slower one. However, we know precious little about the physics of this transition, given that it was dominated by nonlinear and nonequilibrium effects. We have been developing analytical and numerical techniques to model this transition, known as reheating, to come up with possible limits on models of particle physics applicable at these very high energies. Are there universal principles behind bound objects? Nature has plenty of objects that are bound by different kinds of attractive forces. The atomic nucleus and atoms are examples, and so are stars and more exotic objects known as solitons. Some bound objects vary in time and still keep their “identities.” As we model these forces, we note that they show similar properties across many sizes and energy scales. Are there universal principles that guide the existence of these objects? What is the origin for life’s left-handedness? We have been investigating the question of why life prefers specific spatial arrangements for its biomolecules. In particular, why amino acids are “left-handed” while nucleic acids (RNA, DNA) are “right-handed.” (This handedness is related to optical properties of these molecules.) This question is of great importance for understanding the origin of life on Earth and how it may have emerged in other planetary platforms across the universe. Is alien DNA “right-handed” as here? How much can we know of the world? Can we know everything? What about reality? Is it something we can get to or are we terminally deluded? This very interdisciplinary question bridges between the sciences and the humanities, and occupies much of my time when I am not working on more technical stuff. In fact, it is at the core of my upcoming book, The Island of Knowledge, due May 2014.